Opposition Leader Mahinda Rajapaksa says that opposing the draft constitution put forward by the present government does not mean that they as the opposition are “slamming the door shut” on constitutional reform. He said that they acknowledge that extensive reform of the present constitution is necessary and that the 19th Amendment alone has created a great deal of confusion that needs to be put right. “Though we reject the separatist/federalist aspirations of some political parties, we acknowledge that local communities need to be empowered to look after their own affairs within a certain national framework,” he said issuing a statement today (23). The former President said they will be putting forward their own proposals at the next national election to seek a direct mandate from the people for constitutional reform. Rajapaksa also expressed views on the 187-page report prepared in the form of a draft constitution which was tabled by the Prime Minister at the recent meeting of the Constitutional Assembly. He claimed that according to the provisions in the proposed draft constitution, the Parliament and the central government is to be weakened and the provincial councils strengthened immeasurably, the governors are to be made subordinate to the chief ministers, separate armed police forces are to be established for each province and the question of subjects allocated to the provinces and the central government is to be kept open to be filled in later. “The declaration of a state of emergency when necessary is also to be made virtually impossible. Where all this is leading should be obvious to everybody,” he said. The Opposition Leader said that the UNP, TNA and JVP have forfeited the trust of the people due to the manner in which they practiced “dissimulation and deception” in the law making process. 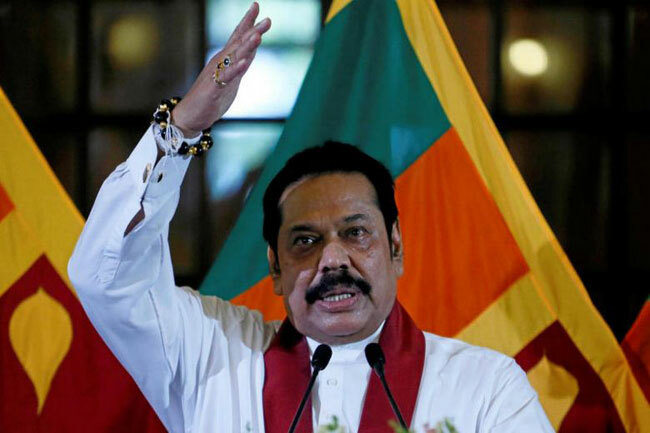 “There is no limit to the perfidy of this government.” Rajapaksa said that after putting forward the draft constitution, members of the government have been speaking only of two issues – the place accorded to Buddhism and the term ‘unitary’. He alleged that in the draft that has been circulated to all MPs, there are several alternative formulations proposed for the provisions relating to the place accorded to Buddhism and the question of the unitary state. “The separatists and federalists have no interest in names or words,” he said. The Opposition Leader further charged that there is a very real possibility that the country will be turned into a federal state while still retaining the unitary label. He stated that the majority of the Tamil people in this country permanently reside outside the northern and eastern provinces while the vast majority of the Muslims reside permanently outside the eastern province. “Such realities should be kept in mind when promulgating a new constitution,” he said.